As a retailer of tiles, our customers choose us because they found something they couldn’t find elsewhere. So they buy from us because of what makes M2 different; what sets us apart from the rest. When you partner with M2 Tile & Stone, you get access to exclusive collections of glass, stone and porcelain tile that feature innovative designs, ranging from classic to ultra-chic, made of the finest materials by leading tile makers from around the world. On-site professional, friendly and experienced staff available for advice and assistance. Certified dealer of Shluter™ products, NuHeat™ systems, and Dupont™ Stonetech tile care and protection products. Our Toronto Showroom features our famous sample card library, that is the best in the business and if a custom sample card will help you made the right selection, just ask. It’s the same if you need a particular tile sample or just one more piece to complete a design job or renovation. The word ‘partner’ really means something at M2 Tile & Stone. It’s a commitment to you and your projects. We protect you. The exclusive M2 Tile & Stone collection is satisfaction guaranteed. Every customer is unique. We meet your unique needs and make it possible for you to realize your ideal vision. 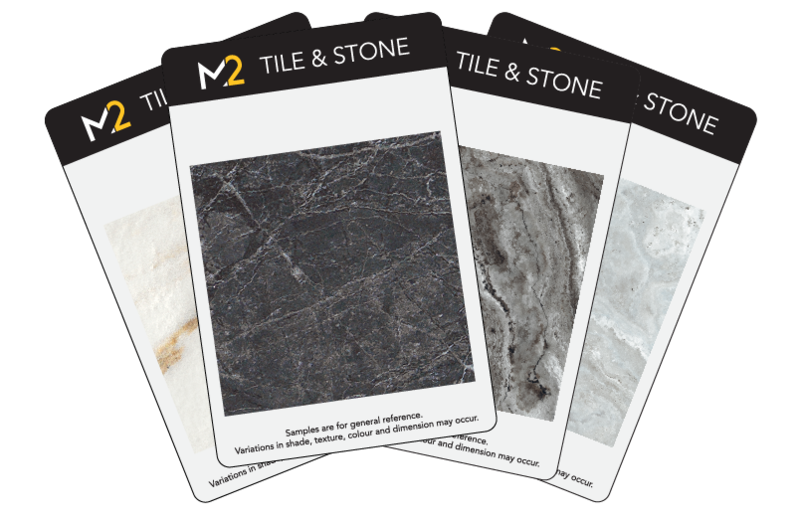 Whether it’s on-time delivery directly to you, or tips on the latest trends and opportunities, or always having the stock you need, M2 Tile & Stone is at your service. We were extremely pleased with M2 Tile & Stone’s help to get what was needed for our Home. You are very fortunate to have such dedicated Staff. Thank you again for all your help. We will certainly refer your company to our friends. M2 Tile & Stone employs a great team of service oriented people. Designers love them for their styles and colours, contractors enjoy working with their products because of the quality and furthermore we love to sell what our customers enjoy.